Click on the links below to view our past newsletters. 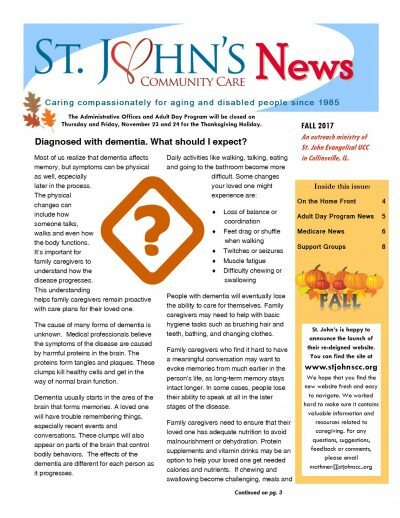 If you would like to receive a printed newsletter in the mail, please email your request to marketing@stjohnscc.org. Include name, address, city, state and zip code where you would like the newsletter to be delivered. To receive our newsletter electronically, please click here to complete the form. In the beginning, St. John Evangelical United Church of Christ members had it in their hearts to serve their home-bound parishioners. The In Home Services Program grew out of that desire. Now it serves people of all faiths in nine Metro East communities including Caseyville, Collinsville, Edwardsville, Fairmont City, Fairview Heights, Glen Carbon, Granite City, Maryville and Troy. In early 2001, we open the doors to an Adult Day Program in the basement of St. John EUCC. We quickly realized the growing demand for this service required a dedicated space. 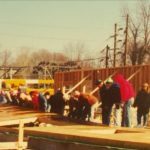 In 2001 church volunteers worked together and built the Adult Day Program building which also houses our administrative staff. Our Adult Day Program is open to anyone that can drop their loved ones off or make public transportation arrangement to our facility. The demand for the Adult Day Program continues to grow and in early 2013, we opened our Adult Day Program-Edwardsville. This community is where many of our service inquiries originate so the Edwardsville location allows us to reach those families that already need us. We work closely with professional organizations and governmental agencies to ensure we are providing high standards of care and up-to-date relevant information to our clients. We believe that when an organization is faith-based and mission-oriented, you do things a little differently. Our everyday caregiving and organizational decisions are based on what is best for our clients and families, not our bottom line. Granted, we are good stewards of our resources but we stretch as far as we can to help the people in our communities. United Way Agency since 1991. Adult Day Program supported by Madison County Mental Health Board since its opening in 2001. Alzheimer’s Association sponsored Support Group and Resource Center since 1991. Licensed and regulated by the State of Illinois. Approved care provider for the Illinois Community Care Program (CCP), Illinois Division of Rehabilitation Services (DRS), and Veteran’s Administration.